Brasilian/New York Style Homemade Pizza - YUM! I know...pizza is very personal. And I know that this pizza is not for everyone. I am sure there will be more than a few "yucks", "grosses", and "how can you eat this?" (especially from Sue M. and Heather). That said, pizza is different all over the planet, every city has their own style, and every person has their own favorite. And y'all just need to start experimenting! I love and miss a good New York City pizza. But I am not there. Brasil makes a really really great pizza too! Less sauce and more cheese. Last night I was in the mood for pizza but wanted to just make one at home with a bunch of different stuff. It turned out great. What is your favorite pizza or toppings on pizza? Started with a pizza base from a local bakery. Coated both sides with olive oil. Then some tomato sauce mixed with homemade pesto sauce, corn, and peas! Now cover the whole thing with cooked ziti pasta. Heck, use whatever pasta you want to use! Now a bit more of the sauce mixture, some sliced tomatoes, some pan grilled Brasilian sausage called Linguica and some bacon bits. Now cover the whole thing with a large amount of shredded mozzarella cheese (or a mixture of different cheeses)! Final step was to add some "batata palha", which is Portuguese for Potato Sticks. Brasilians love their bags of Potato Sticks and it is very common on pizza. Bake in pre-heated oven until the cheese has melted and it looks yummy! Cut a slice...or two...and enjoy. Ruy thought having pasta on pizza was strange and I had to remind him that pizza places in NYC have some very strange stuff on their pizzas. But, to each his own. Listen, Brasilian pizza has some strange pairings and concoctions as well. They love cream cheese on pizza...not me! But...a different country, a different culture! Would love to hear what your favorite pizza toppings or flavors are and what is the type of pizza from wherever you guys call home! A few weeks ago, my friend Justin showed me a stamp set he had bought on Simon Says Stamp called Naughty Nautical. One of the phrases in the set said "Oh Ship! I forgot your birthday". I'm sorry but that just cracked me up! At first I was completely blank on how I could ever work this phrase into a card. So I filed it away for future use. The future came faster than I expected! I had just gotten an order from Reverse Confetti and one of the dies I ordered for the store is called "Doin The Wave". Not only does the die look like bacon but it also would work as ocean waves. This was the point when that phrase popped back into my head and, remembering that I had forgotten to send a friend a birthday card, I was now going to get this idea out of my head. Now, since I am in Brasil and did not order this set from Simon before I left NYC, I printed the phrase on cardstock to use on the inside of the card. I think the whole thing came together nicely and hope you guys like it. But, buy the set from Simon Says Stamp before they send me a letter from their lawyers. LOL. Start with an A2 white cardstock base. Cut a piece of textured dark blue cardstock, 4.25" x 5.5", and adhere it to the card front. Cut a piece of very light blue cardstock 4" x 5.25". You want to use a color of blue that resembles the sky. Now to die cut your pieces. I used the same dark blue from the card front and another lighter blue that would work well as "waves" and cut them with the Doin The Wave die. Then I used the Sun 'N Clouds die and cut the sun from a piece of orangey/yellow scrap cardstock that had small textured dots on it and I cut some clouds from white glitter scraps. Finally, I cut the large sailboat from the Marina Sailboats set from craft cardstock and then again using a piece of patterned paper that I would use as the sails. Now to put it all together. Grab your favorite glue and the light piece of cardstock. Start by gluing the largest of the light blue wave to the bottom of the cardstock. You want to start with the lighter blue for a contrast against the dark blue card front. Then adhere the other waves, alternating the colors and sizes until you get the look you like. Before you glue the top wave, slip the craft sailboat under the wave and then cover the bottom part with the final wave. The waves will hang off the bottom and the sides and you will trim after you have glued them all down. Then trim the patterned paper for the sails and glue them to the sailboat. At this point, since you will be using pop dots, I suggest adhering this light blue cardstock piece to the card front. Then, grab your stash of pop dots (cuz you know you have some) and put some on the back of the sun and the clouds and adhere to the card front. Here is the final outside front of the card. And here is the inside. I typed up the phrase and printed it out on white cardstock. Then used the smaller of the Give Thanks Labels to cut and emboss around the phrase. Then used the larger of the Give Thanks Labels from the same paper as the card front and layered the pieces. Happy Sunday everyone!! It's been a busy week for me. I am still working away at that baby album, my allergies have kept me busy grabbing tissues for days now, and Ruy returned from the USA and we have been trying to upload all of the stuff to the website. And, of course, I am itching to play with all the new Memory Box dies and a stash of new stuff from Reverse Confetti (one of my new favorite companies) - but do not have the time yet. I cannot wait to start sharing some of my projects using their products! 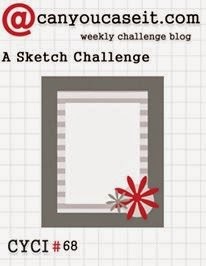 But I did find time to make a quick and easy card for this week's CanYouCaseIt? Challenge No. 69. I finally got to use a mini baby blueprints set from Tim Holtz. You can make this card in less than 15 minutes. I swear!!! I started with dark blue cardstock, 4.25" x 11", folded in half, and used it as a top fold card base. Then I adhered a piece of light blue cardstock 4" x 5.25" to the front. Then adhered a piece of light blue plaid designer paper 2.5" x 4" to a piece of the same dark blue cardstock as the card base, 2 3/16" x 4" and adhered that to the light blue cardstock. Then I stamped the "a blessing from above" phrase from a set called Blessing From Above by Gina K. Stamps. The final step was to heat emboss the baby onesie image from the Baby Mini Blueprints set by Tim Holtz using Versamark and Black Sparkle Embossing Powder by Ranger. I colored it in with Y08 (Acid Yellow) and G14 (Apple Green) copics, trimmed it and layered it on a piece of the dark blue cardstock and then adhered to the front left side. Then I glued a light blue crystal in each corner of the card. That's it!! Really easy. These would be a really nice baby announcement with all the details on the inside of the card. 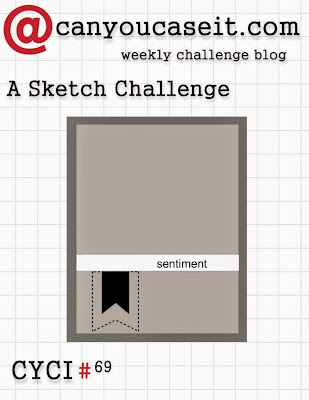 I really hope you enjoyed this card and I hope you can find some time this week to make a card of your own to enter into this week's CanYouCaseIt? Challenge too! Would love to see what you guys do. Good morning everyone. Yes, I know, it's May. Not December. Not even November. But I think holiday cards should be made every month. Most card makers get to November, realize they have yet to make a card and start stressing over getting them done in time. Well, if we can make at least 1 or 2 per month, we could have up to 24 cards by December 1. Maybe this very easy card will get the creative juices flowing!! This all started the other night when I was on Facetime with Justin while he was with Renee at Scrap-A-Latte. He was showing me some of the samples of Christmas cards in her store and I realized that Renee is really a great scrapbooker but she needs some help in the card making area (and she is the first to admit it too). Justin made me show her the card and Renee was just gushing and squeaking. That night I showed the same card to my BFF Sue and she could not believe that i made it in less than 15 minutes!! So, this post is going out to Sue, Renee, and Justin. Unfortunately, Memory Box is no longer making these dies. I had no idea about that until I started this post. But you can find them online at the links below, for which I do not get a kickback! But they are reputable sites that I have ordered from. And, if you have the dies, I hope you get to make this. There are 2 ways you can cut and adhere the pieces in the La Rue die. 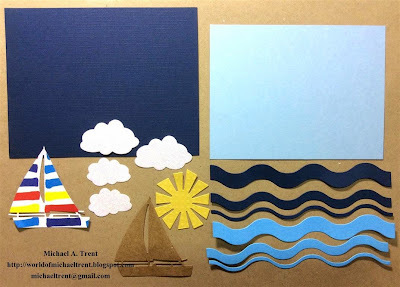 No matter which method you use, you will start with 5 pieces of cardstock cut 3.25" x 4.25". Two of the black cardstock and one each of the red, gold, and green glitter paper. The first method is to lay the La Rue die on one of the black cardstock and the 3 glitter papers and cut using your die cut machine. You will also cut one of the Drop Ornament from the other piece of black cardstock. The pieces will probably fall out so make sure you keep them all together. With this method you will adhere the pieces with glue like the Zig 2 Way fine tip or chisel tip glues. The other method is to adhere double sided tape to the back of the pieces of cardstock and then die cut with the La Rue die. Do NOT remove the outside layer until later. With this method, as you remove the piece from the die cut, you will just remove the backing to that piece and fit into the larger piece. You will understand a bit further down. Putting It All Together - This is like a jigsaw puzzle. No matter which method you choose above, the steps are the same. The only difference is that you will either use glue or you will remove the tape backing. Step 1 - Adhere the outline of the ornament from the La Rue die to the solid piece of the Drop Ornament. Step 2 - I like to start with the "heart" from the center of the red glitter piece and adhere those pieces into the black cardstock ornament. See how this comes together now? From here I just take pieces of the gold and the green glitter ornaments and glue them into the main piece. Until the whole ornament has been put together. I make sure to cut the ornament topper from a piece of the gold glitter and adhere to the top. Now to adhere to the card front. I wanted a bit of texture to the card front so I cut a piece of white cardstock - 4" x 5.25" and embossed it with the Swiss Dots embossing folder. Then I cut the Pine Needle die - twice - from green textured cardstock. I cut the branch twice to make it look fuller when I glued it down. Note - when you cut the branch, you want to lay the die as close to the top of the cardstock. If you put it in the center of the cardstock, the top portion will not pop out of the paper without you cutting it out. Just an FYI. Glued the branch to the top of the embossed white cardstock. Then I adhered the ornament to the center as it was coming out of the leaves. Finally I cut the Noel die from the Wonderous Wreath Bundle from Stampin Up and adhered that to the bottom of the card front. Oh, and I adhered some Green Stickles to the branches! Now, what's cool about doing this project is - you will be left with all the pieces from the 3 glittered die cuts. If you go back and cut the dies again from black cardstock, you will be able to make 2 more of the ornaments. Because you used the red for the heart in the first one, you will have to use the gold and green for the heart in the other two. Well, I hope you enjoyed this bit of Christmas in May. Let me know what you think! Note - I like to use the glitter papers with the ultra fine smooth glitter. American Crafts makes a nice line. The papers sold at Michael's also work well. I find that when I used a thicker glitter paper with a die cut or punch, they tend to crack. Just another FYI. Good morning everyone!! I hope everyone has had a great week! I have been very creative this past week. I had the card for today finished days before I expected, which gave me the time to start a baby mini album. It is not yet finished but I got the outside cover done and a few pages. If you check yesterday's post, you can see what I have done so far. I love making these books!! For this card I started with an A2 card base of white cardstock, top folded. Then I adhered a piece of decorative scrap paper from a 6" x 6" paper pad I had laying around called Lucky Charm. It's made by American Crafts for the Dear Lizzy line. Then I die cut the largest die from the Stitched Rectangles STAX from a solid piece of paper from the same pad, and the next die down from a piece of watercolor paper. Then I stamped the flower image from the Cherish Every Moment set, using Archival Jet Black ink from Ranger, onto a piece of watercolor paper and then two more times onto scrap watercolor paper. Colored them in using my Inktense Pencils (love these) and a water brush. Notice that I only colored in certain areas on the scrap images because I knew I would be cutting these parts out to pop dot. Adhered the red paper to the card front and then adhered the watercolor paper to the red. 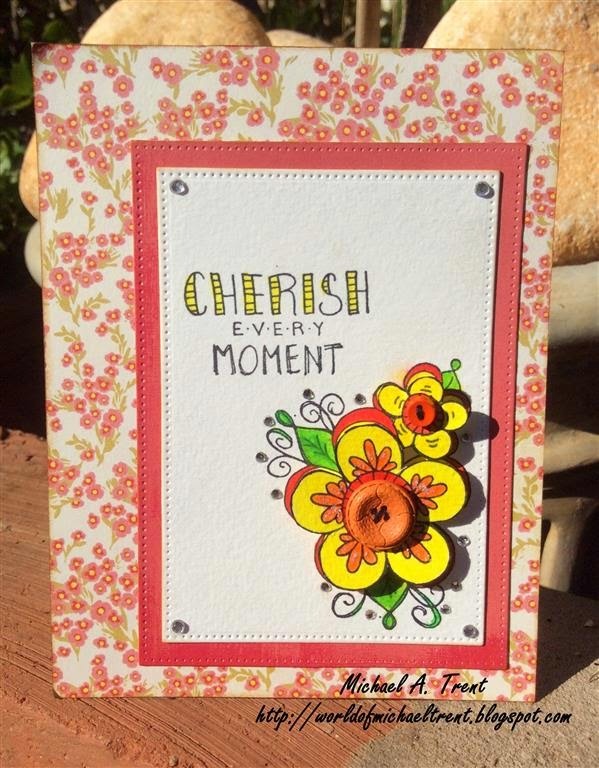 Cut out the parts of the flowers from the scrap watercolor paper, put a small button through each of the flower centers, added some pop dots to the back and adhered them to the card front. Then I glued some small crystals to the small dots in the image and to each of the 4 corners of the watercolor paper and applied some Frosted Lace Stickles to the flowers. A2 White Cardstock for base. 4.25" x 11" folded at 5.5"
The inspiration for this album comes from a women I found on youtube about a year ago. Her name is Sheryl and she has a series of videos showing how to make a book like what I am making. Once you watch the videos you will be able to take the different aspects of what she does and make your own books. The videos are really well done and very easy to follow. You can find her HERE. The photo at the top is the front of the book. The papers are from a Brasilian scrapbook paper company. The stars are chipboard from Momento Divertido (Brasilian), which I embossed with Denim embossing powder from Stampin Up and Shabby White embossing enamel from Stampendous. The "hello" is a small wooden piece I found in the clearance section at Michael's about a year ago, also embossed with Denim, and the "baby" is from the Oh Baby die by My Favorite Things, which I cut from dark blue paper and then covered with glossy accents. I am on the fence but I think I want to add one more small star above the "hello". Here is the book fully open showing the front, spine and back of the book. I also got a few pages done. The above will be the first page. The baby onesie is a die from Top Dog, as are the crown and the neck and leg pieces. Paper is brasilian and I added a small button at the bottom. Inside will be the info on the baby's birth. The outside of page 2. The button holds the front flap closed. The page opened to show the areas for photos or journaling. For this page, the button holds the flap down and when you open it, you have room for 2 photos or some journaling. Lots of layers but a fun page. This is the last page done so far. The polaroid diecuts are from a stamp/die set from A Jillian Vance Design called Foto Frame. 4 little photos on one page. Love it!! The letters are from a sticker set I found on clearance someplace. But they look great on this page. Well, that's it so far. It's fun to do but a lot of thinking goes into this book. As I get more pages done, I will add them to the blog until the whole book is finished.